VSS Data Export extracts all the file and project information from MS Visual SourceSafe to an SQL server or Access database. - Monitoring and enforcing Sourcesafe usage policies. - Extraction of source history for record keeping (e.g. version, comments, labels). -Tables - relational, object, index-organized, partitioned (range, hash, composite, list), temporary, clustered. Views - standard, object and XML. Export 837 and 835 files to CSV, XML or DBF. Create SQL Tables via ODBC. Generate 276 claims status request from 837 file. Generate 835 Remittance files from 837 files. Format X12 files to text, .rtf, .pdf and .html. SSBrowser : A Sample Visual SourceSafe Automation. - Operations such as CheckIn, CheckOut, Undo Checkout, Label, Add projects, files etc. Vss2Git is a Windows GUI application that exports all or parts of an existing Microsoft Visual SourceSafe 6. Vss2Git is a Windows GUI application that exports all or parts of an existing Microsoft Visual Sourcesafe 6.0 (VSS) (Wikipedia) repository to a new Git repository. It attempts to construct meaningful changesets based on chronologically grouping individual project/file revisions. SQLDBU allows you to create edit or drop SQL tables with a simple intuitive interface. 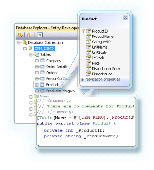 Advanced Query Builder is a powerful component suite for Borland® Delphi® and C Builder® intended for visual building SQL statements for the SELECT, INSERT, UPDATE and DELETE clauses. The Report Miner RptDiff VSS Add-in for Crystal Reports is the first add-in product for Microsoft Visual SourceSafe (VSS) 2005 to support Crystal Reports files. Dynamsoft SourceAnywhere for VSS (Dynamsoft SAW for VSS) is a remote access tool for Microsoft Visual SourceSafe (VSS). Quickly review all the changes you made to checked out files before checking them back in. Automatically checks out a file when you start editing it. A SQL Server add-in which converts existing stored procedures and functions into CLR. SQL.CLR is designed to run inside SQL Server Management Studio as well as Microsoft Visual Studio.